Gold firmed overnight, trading in a similar range to yesterday’s - $1243.65 - $1249.65 - and continued to trade against the direction of the US dollar. Gold climbed to its $1249.65 high during Asian and early European time but was capped at $1250 (double top 12/7 and 12/10 highs, options). Its rise was fueled by softening in the DX (97.21 – 96.87), which was pressured by a rise in the yen (113.37 – 112.99), a rebound in sterling from yesterday’s 20-month low ($1.2550 -$1.2638, possible new declaration on the Irish backstop, UK wages beat expectations), a recovery in the euro ($1.1350 - $1.1400, better German and Eurozone ZEW, reports Italy pushing for deficit target of 2% to comply with EU), along with a miss in the US NFIB Small Business Optimism Index (104.8 vs. exp. 107). The surprise resignation of India’s central bank head was also gold supportive. Mostly firmer global equities were a headwind for gold, however, aided by reports that Chinese Vice Premier Liu had been in discussion with Mnuchin and Lighthizer to de-escalate current trade tensions. The NIKKEI slipped 0.3%, the SCI rose 0.4%, European markets were up from 1.2% to 1.6%, and S&P futures tacked on another 0.6%. 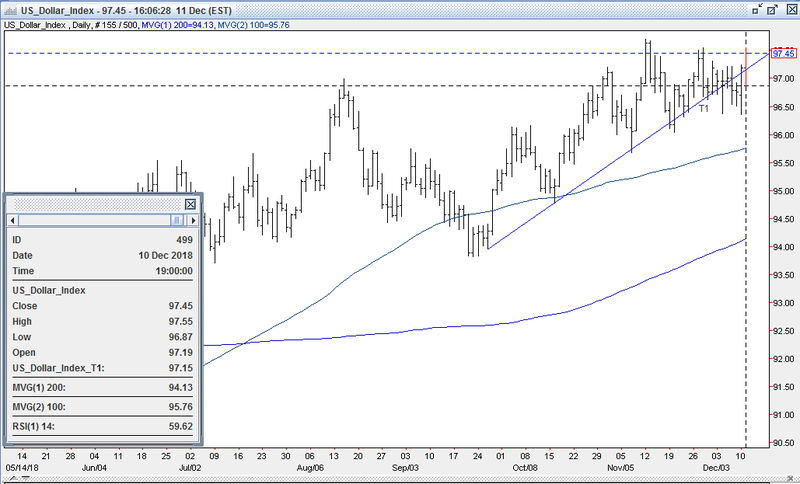 Firmer oil prices (WTI from $50.70 - $51.68, Libyan supply outage continues) aided the move in stocks. Ahead of the NY open, US equity futures climbed further (2669, US-China news resonating, Bloomberg report on China considering easing auto tariffs), while the US 10-year bond yield moved up to 2.888%. The DX rebounded to 97.02, and gold pulled back to $1246. At 8:30 AM, US Headline PPI (0.1% vs. exp. 0), and Core PPI (0.3% vs. exp. 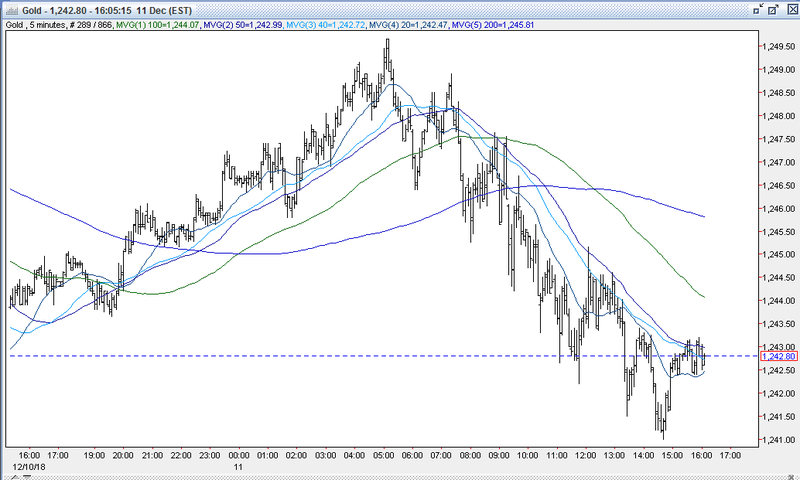 0.1%) were stronger than expected and lifted S&P futures further to 2678. However, the 10-year yield ticked down to 2.866%. 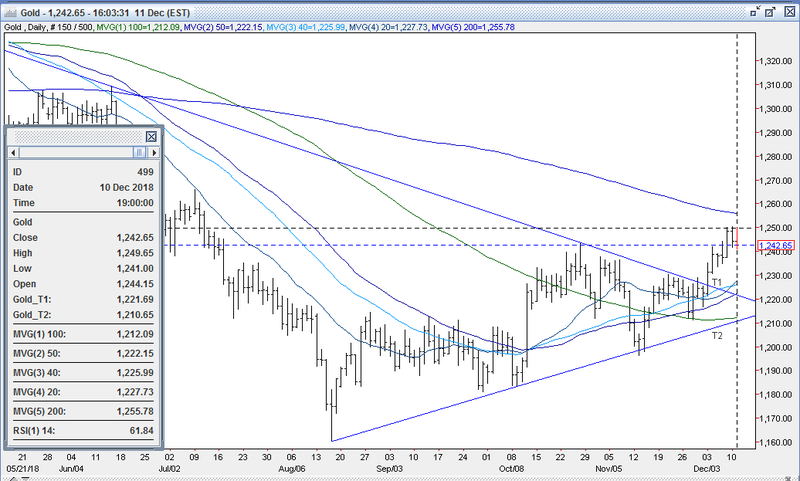 The DX advanced to 97.28 and pressured gold down to $1244, where support ahead of the overnight low at $1243.65 held. As we’ve seen many times in recent sessions, some bargain hunting buying quickly emerged and took gold back up to $1246. By late morning, US stocks had trimmed their gains (S&P +8 to 2646 – 10% correction level) as the 10-year bond yield ticked to 2.856%. The DX, however, rallied further (97.55, 2-week high) off of a tumble in the pound ($1.2491 – 21 month low) and the euro ($1.1306) after German Chancellor Merkel told PM May that there was no way to change the current Brexit deal – echoing comments from the EC’s Junker. Gold traded down to $1242.20, where it found support ahead of yesterday’s $1242 low. Near mid-day, comments from Trump that he would be proud to shut down the government for border security when negotiating with Schumer and Pelosi sent US stocks lower (S&P -4 to 2633). The 10-year yield edged down to 2.848%, and the DX ticked down to 97.40. 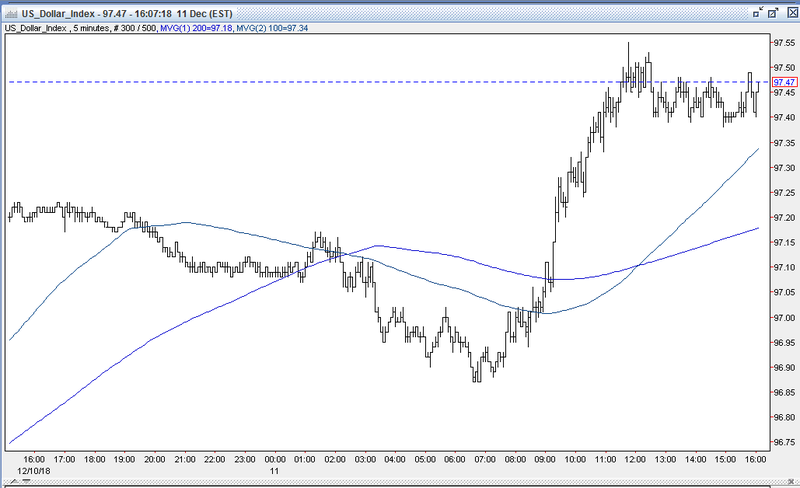 Gold moved higher in response, clawing back to $1245. Into the afternoon, US stocks continued to slide (S&P -16 to 2621) with the Financials, Industrials and Energy sectors leading the decline. The 10-year yield hovered around 2.85%, while the DX was steady around 97.40-45. Gold - failing follow-through buying - dipped back to $1242. Later in the afternoon, US equities made a comeback (finished off 1 to 2637 ). The 10-year bond yield rose to 2.886%, while the DX remained stable around 97.40-45. Gold was pressed lower to $1241, but again, dip buying brought it back to $1243. The yellow metal was $1243 bid at 4PM with a loss of $1. Open interest was down 4k contracts, showing a net of profit taking from longs from yesterday’s decline. Volume was lower with 215k contracts trading. Bulls were flustered by gold’s inability to crack the $1250 resistance level again last night - especially off of the weakness in the DX. Bulls were looking for a breach of this level to bring the 200-day moving average at $1245 into play – above which they expect significant buying. However, bulls were encouraged that despite the DX reaching 97.55, gold held fairly well, with support holding ahead of $1243 – the prior resistance level. Bulls still feel the market has demonstrated a clear upside break of its pennant formation (down trendline from 4/23 $1336 high) and should be able to continue to prey on covering shorts and use the momentum from sidelined new longs to drive the market considerably higher. Bulls are looking for continued financial market turbulence to re-test resistance at $1250 and then challenge $1256 – the 200-day moving average. Bulls feel a breach above the 200-day moving average will be consequential to launch a sharper upside move. In addition, bulls maintain that yesterday’s Commitment of Traders Report still shows the funds with a very large gross short position (124k contracts). They feel the that the short side of gold is still a very crowded trade and that the gold market is still set up in a highly favorable position to move up from potential heavy short covering and sidelined longs returning to the market. Bears were encouraged that gold couldn’t rally past $1250 again last night, and succumbed to dollar strength off of continued Brexit turmoil. Bears remain comfortable selling into strength, feeling moves toward overhead resistance at $1250 and $1256 will continue to provide good entry points for short positions – especially with gold approaching overbought (Friday’s 14-day RSI at 67.3, currently 62). Many bears are firm in their conviction that fuel from dollar strength, a return to higher interest rates (though that argument has lost some steam with 10-year yield hovering around 2.85% and recent Fed speak decidedly more dovish) and a rebound in equities will provide downside pressure on gold, and see prices north of $1200 offering a great opportunity to get short(er). This is witnessed by yesterday’s COT Report that a shows a very large gross short position (124k contracts) still remains. Bears will look for a breach of initial support at the trendline at $1222 to bring about a re-test of $1212 (100-day moving average, double bottom), $1211 – the up trendline from 8/16 $1160 low, and then $1200. All markets will continue to focus on geopolitical events (especially Brexit developments), developments with the Trump Administration (especially on US-China trade, potential legal issues), oil prices, and will turn to reports tomorrow on Japan’s Machine Orders and Tertiary Industry Index, Chinese Foreign Direct Investment, Eurozone PPI, US CPI, Real Earnings and Oil Inventories for near-term direction.